Would you believe that the anti-bribery stance is already catching pace in India this year? Yes, the positive Anna-effect is gradually spreading its wings across the country, with India featuring as the ‘most improved’ country in 2011 bribery index. While Chinese (27th rank) and Russians (28th) have emerged as most likely to pay bribes while operating abroad; the latest data from Transparency International’s Bribe Payers Index (BPI) 2011 indicates that India’s score improved the most amongst the index of 28 leading export countries and territories to bribe abroad. 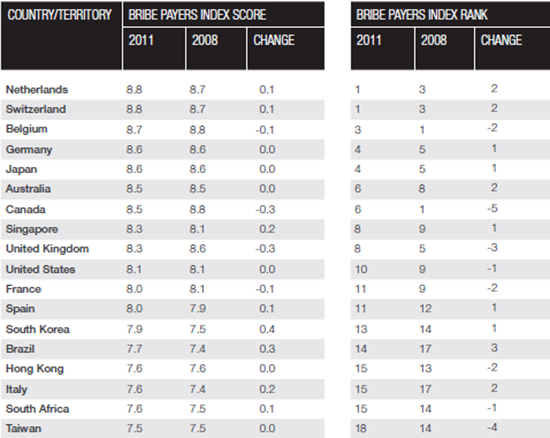 “India’s score improved the most, with an increase of 0.7, but it still remains near the bottom of the corruption list. Canada and the United Kingdom saw the most significant deterioration in their scores with a drop of -0.3,” read the report that calculates foreign bribery and captures perceptions of bribery across business sectors. 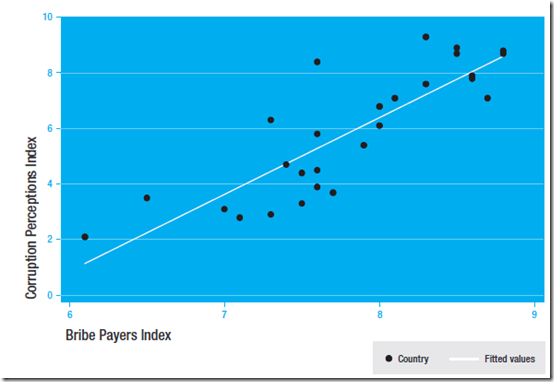 In 2011, India notched 19th rank with a score of 7.5, as against a score of 6.8 in 2008 Bribe Payers Index, which sums up to a remarkable improvement of 0.7 points over the last count. Interestingly, the index includes scores and ranks of all the G20 countries. Amongst other major economies, this year’s top rankers Netherlands and Switzerland, with the score of 8.8, just about managed to pip BPI 2008 toppers Belgium (8.7) and Canada (8.5) by a marginal difference. The survey draws attention to foreign bribery carried out by companies, which needs to be tackled by the government by having regulatory environment and effective anti-corruption system in place for their countries. The index underscores the link between a government’s fight against corruption at home and foreign bribery by its companies by measuring levels of perceived corruption in the public sector. The report urges the governments to participate in the anti-corruption drive by ratifying key international anti-bribery conventions. Further, the survey findings revealed the likelihood of bribes being paid by companies in 19 different sectors, which was more or less common across all the sectors. Agriculture, Light manufacturing and Civilian aerospace are perceived as least bribery-prone sectors; whereas Public works contracts, Oil and gas, Utilities and Real estate sectors ranked at the bottom of the bribery index. However, in India, we need a strong government resolve to fight corruption rather than corporate awareness regarding the same. May be the Lokpal Bill can help India in improving the rank a lot more.